Lake Tomahawk "King of Lakes" on the Minocqua Chain is the site for this executive Tomahawk Log Home. Sitting on 100ft of Caribbean sand frontage offering western exposure with all day sun and beautiful sunsets! Come see this 4 BR, 3 BA energy efficient square log home featuring a Gourmet chef&apos;s kitchen, spacious master ensuite w/ private lakeside deck, both wood and gas burning fireplaces, and 3 car attached garage. Home features hardwood floors and towering log beams throughout as well as in floor heat and forced air furnace w/ central A/C. Property is meticulously landscaped with large stone steps and boulders as well as a blacktop driveway. In addition, this property offers a large boathouse with upper party deck and wrap-around cable railings with incredible views. 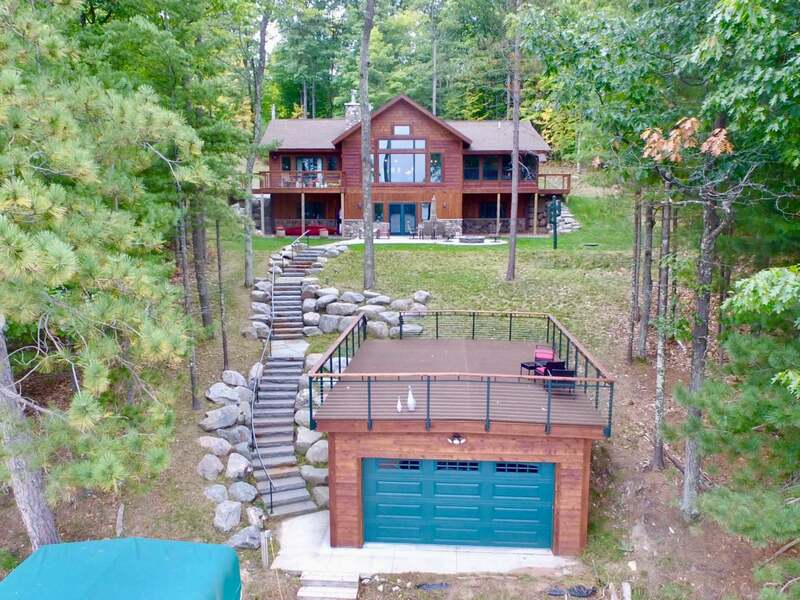 Enjoy living on the most private lake of the Minocqua Chain while being a short boat ride to many bars and restaurants. Don&apos;t miss this opportunity today to see this one of a kind home!